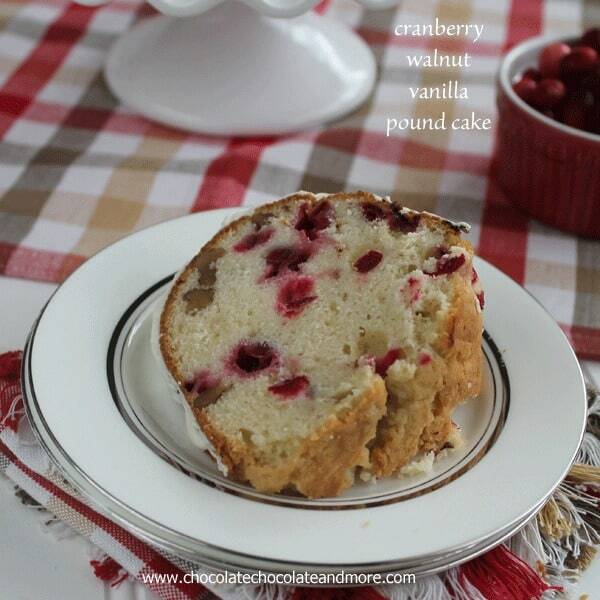 Cranberry Walnut Vanilla Pound Cake - Chocolate Chocolate and More! 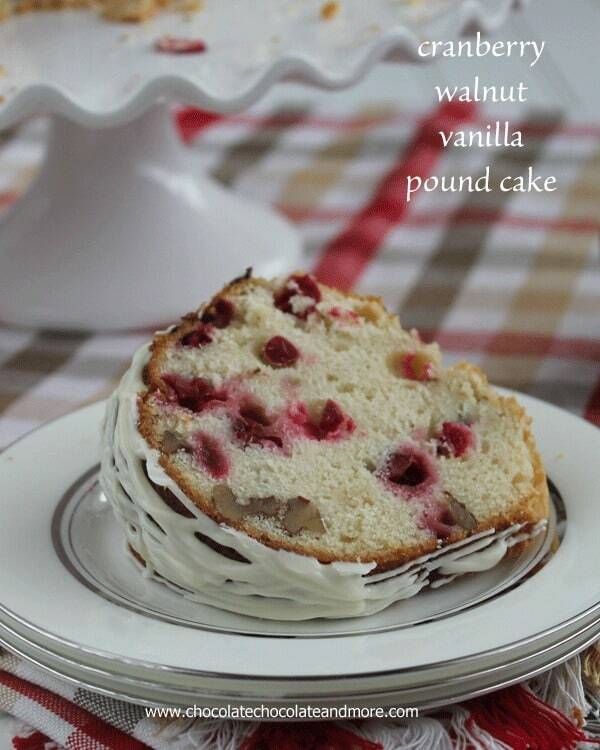 Cranberry Walnut Vanilla Pound Cake drizzled with White Chocolate-perfect for the holidays! My mom and my kids have a tradition every year. While I’m the baker in the house, cookies, breads, cakes, breakfast, lunch and dinner, my mom does make a few things. One of them is a Cranberry Apple Crumb. That’s not what it’s really called but it’s a good description of it. And every winter holiday (both Thanksgiving and Christmas) my mom and the kids gather in the kitchen and make this together. I think my kids could probably make it from memory, they’ve been doing for so long. It goes on the table with the turkey, stuffing, mashed potatoes…yup, we consider this part of our fruits and veggies even though it’s probably more of a dessert. This year, however, we won’t be having this yummy treat. My mom and the kids decided we needed a change up. I haven’t figured out what will replace it on the table yet but I did seize the opportunity to use some of the cranberries. 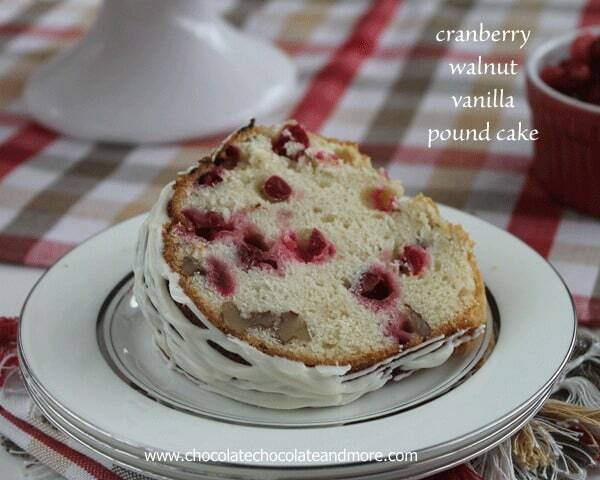 It’s a shame fresh cranberries are so hard to find except during the holidays because this cake is amazing. The sweet of the cake, the tart of the cranberries, the crunch of the walnuts all combine to make every bite a taste treat. And of course with white chocolate drizzled all over the top, well, that’s just the icing on the cake! In a medium bowl combine cranberries and 2 tablespoons flour, tossing to coat berries. Set aside. Cream butter and sugar until fluffy. Add in vanilla. Add eggs, one at a time, beating well after each addition. Combine remaining flour, baking powder, baking soda and salt. Add 1/2 flour mixture to batter, then sour cream, then remaining flour. Mixing well after each addition. Fold in cranberries and walnuts. 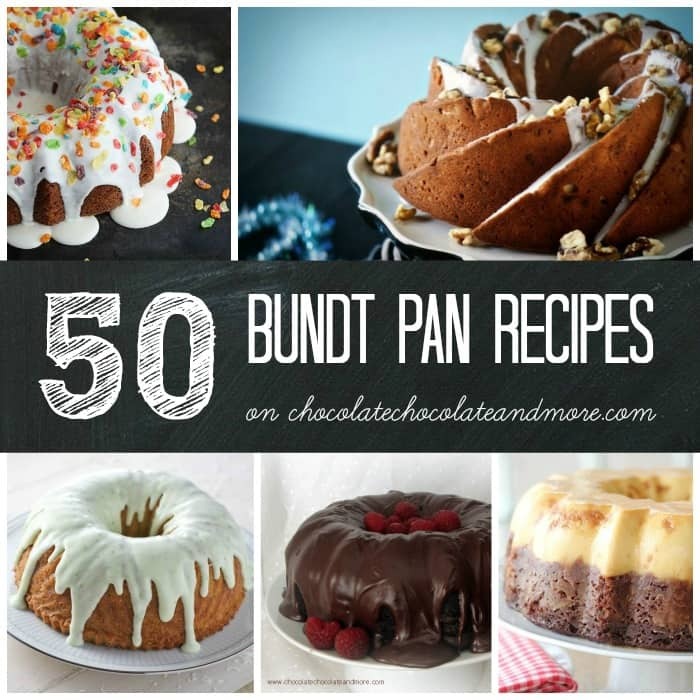 Spoon batter into a well greased bundt pan. Bake in a preheated 350 degree oven for 50-60 minutes, until toothpick inserted in center come out clean. Let cake cool in pan for 1 hour before removing to wire rack to cool completely. For chocolate drizzle-Melt white chocolate using a double boiler or in the microwave according to package directions. If chocolate is thick, stir in shortening to thin it. Drizzle white chocolate over cake and let harden before serving. For ease in drizzling, let melted chocolate cool a bit. Line a cup with a plastic bag so one corner is pointed down. Spoon chocolate into baggie then loosely twist bag closed at top. Cut corner of bag to make a small hole, then gently squeeze bag to drizzle over cake. What a lovely cake for the holidays. The red cranberries sure do make it just right for the season. This sounds delicious. Not to mention beautiful. 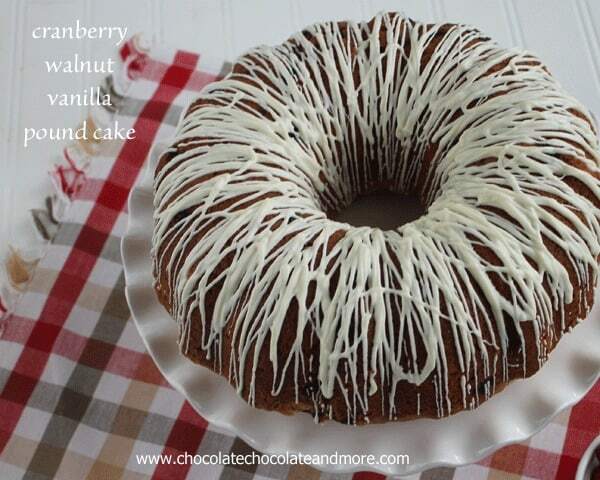 I love Bundt cakes. I’d love it if you linked this to What’d You Do this Weekend. Have a blessed Thanksgiving. 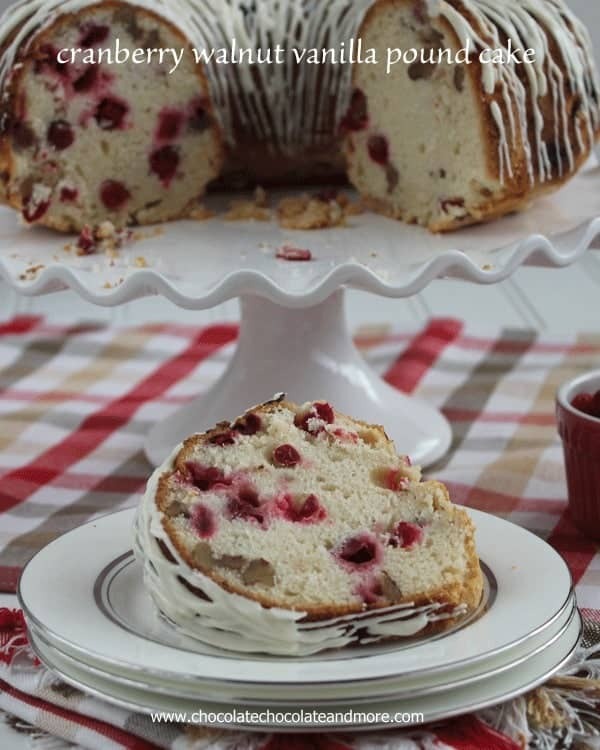 I just love cranberry season – this bundt cake looks fantastic so I’m pinning!! I have a love affair with cranberries! Paired here with walnut in a vanilla pound cake, I’m definitely going to need to give this a try. 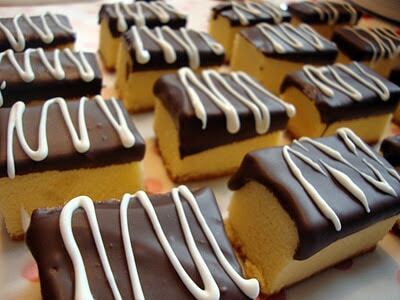 And that white chocolate glaze drizzled over the top sounds wonderful! This looks delectable! Thanks for sharing the story of your kids and mom making this together. That is really sweet. Cranberries and walnuts pair so well together. This is the perfect cake for the holidays! Cranberries are one of the easiest things to store for use throughout the year. They can be frozen without any preparation. I usually buy several extra bags when “in season” and just throw them in the freezer. I use cranberries in apple pies and muffins all year. I made this for Christmas brunch and everybody loved it. Absolutely delicious! Could you use craisins and soak them in orange juice or warm water? I would like to make the cake and don’t want to wait till next Christmas.